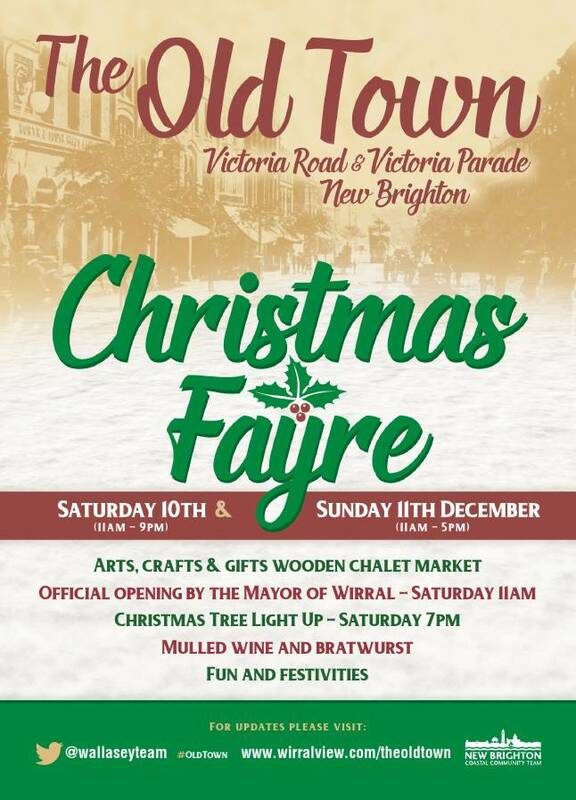 10th December 10.00am – 4.00 pm Christmas Tree Festival. 3.30 pm Carols Round the Tree. Everyone is welcome at all of these events and services. For just £1.50 you can buy a strip of five of our new self-adhesive stamps at many local shops, and Morrisons at weekends, (just 30p per stamp). Look for the yellow poster in the shop window, or ask. You must post your Christmas cards in the red or green post boxes in the shops that sell stamps, and remember that we only deliver to the Wirral, to the area inside New Brighton – Eastham – Neston/Puddington – Hoylake – New Brighton, but not to Little/Great Sutton, Ellesmere Port, Chester, Liverpool. Christmas cards will be delivered the weekends of 10th /11th and 17th /18th December, but please post your cards early. LAST COLLECTION is NOON on WEDNESDAY 14th Dec. Charities this year include Friends of Clatterbridge Hospital; Down’s Syndrome (Wirral); G. H. Peers Club; Merseyside Tramway Preservation Society; Northern Lights; Wallasey Sea Cadets; Wirral CHICS (Children with Cancer Support Group); Wirral Narrowboat Trust; and others. This year will bring the total donated to charities over the scheme’s life to over £600,000. Christmas plans for the Driftwood Fairy Vale. the driftwood fairy vale in the New Year. 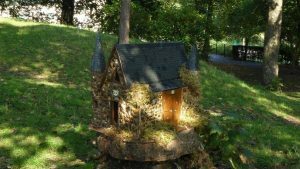 and will return ready for their Christmas treats The fairy Gardner looks forward to creating magical memories for all the many visitors to the Driftwood Fairy Vale and hopes their wishes come true. When you look around New Brighton these days, the enduring interest in the history and heritage of the town is only too clear — evidenced by so many of our local businesses that display old photos. But there’s one piece of our town history that seems to get neglected and that’s our connection with The Beatles !. There’s a commemorative stone on Tower Promenade which celebrates the fact that they played at the Tower Ballroom on 27 occasions in the early 1960’s but it’s not prominently placed and often gets completely overlooked by visitors and locals alike. 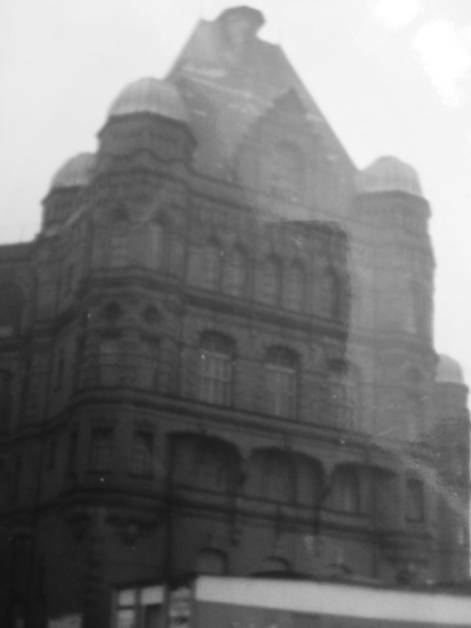 The Tower Ballroom was the fourth most played venue by the Fab Four during a time when they were learning their stage-craft, beginning to write their own songs and where they were still playing as the first rumblings of “Beatle-mania” began to reverberate across the United Kingdom and into the rest of Europe. All of them of course had a pre-Beatles familiarity with the town. 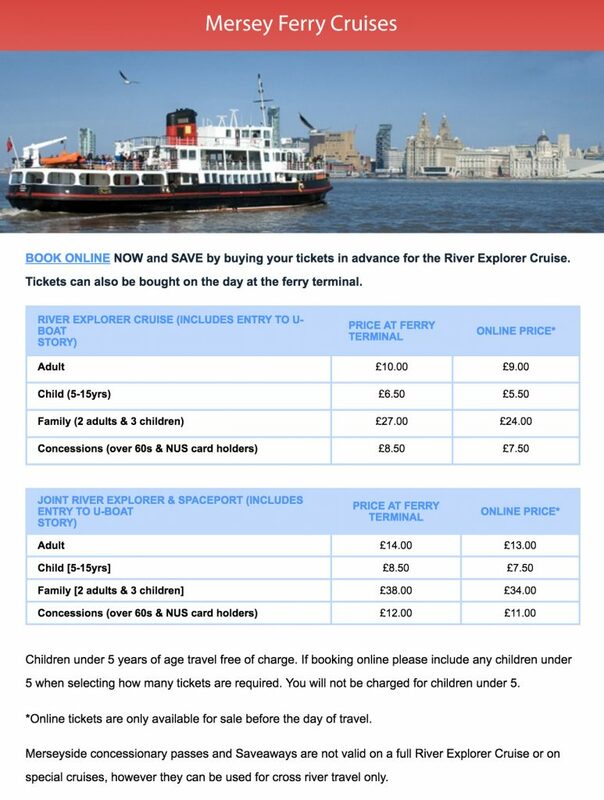 Like tens of thousands of other Liverpool day trippers each of them made their way over here with either friends or family:— in the 50’s catching the iconic New Brighton summer-cruise Ferry The Royal Iris. The Beatles would later play on The Iris four times and supported Acker Bilk on one occasion and Johnny Kidd and The Pirates on another. There are photos of the McCartney family on New Brighton beach, Jim pulling faces for the camera, Mary smiling shyly and Paul and Mike laughing happily – an ordinary Liverpool family on a day trip to the seaside. Later, John and Cynthia made their way over from Liverpool when their relationship first began and Cynthia name—checks New Brighton in her book “John”. 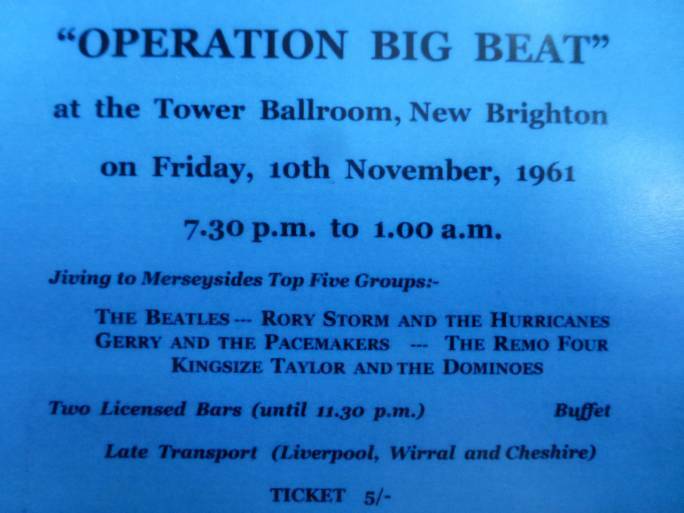 But it was a Liverpool promoter called Sam Leach who first brought the group “The Beatles” to New Brighton, when he decided to hire the Tower Ballroom and put on a Rock n Roll Show, like the ones he’d read about that were taking place in America. The hire cost was £50 and the idea was to have a big venue with lots of acts, where the youngsters could be packed in to indulge their passion for the sort of music that was driving their Mums and Dads to distraction. Sam called it “Operation Big Beat” and on November 10th 1961 over four thousand people turned up, which made it all a bit of a runaway success. So much so in fact that – against Paul McCartney’s advice – Sam decided to do it all over again two weeks later. 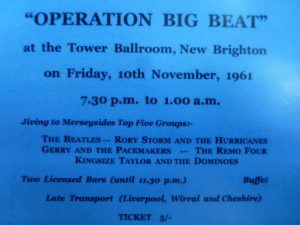 On the night of 24th November 1961 though, The Beatles played to an audience in excess of four and a half thousand, which gives New Brighton an unparalleled role in The Beatles story, because this was the largest crowd that they ever played to on the mainland of the UK !. the Wallasey police closed the roads to The Tower Car Park due to the volume of traffic. Gerry Marsden similarly had to walk the last few hundred yards and laughingly said to Sam “It’s like Anﬁeld on match day 2!”. heroes, the pleasure evident on each of their faces. On 6th April 1962 The Beatles were here once again and before going on stage Paul noticed Iris Caldwell (Rory Storm’s sister) dancing with the professional dance group she’d joined “The Original King Twisters”. He already knew the seventeen year old lris well, but that night he was so impressed he went home and started to write a song, that was mostly complete when John called at his house the following morning. He was calling it “Seventeen”… . and it was one of the songs – now called “I Saw Her Standing There” – that less than two years later virtually brought America to a standstill when they played on the Ed Sullivan Show. It was also the last song that John Lennon ever performed live, when in 1974 he appeared at Madison Square Garden in New York with Elton John. It was a song that came from New Brighton !! There’s a letter from John Lennon written in September 1962 that thanks “Joan” for her fan letter, then goes on to say a (broken) plectrum is enclosed, also an autographed cigarette packet, and then it chattily states:- “I hope you enjoyed The Tower performance on Friday – I hope next week’s is better” (ll). Hard to think that such personal correspondence to an unknown fan was once so part of their lives. 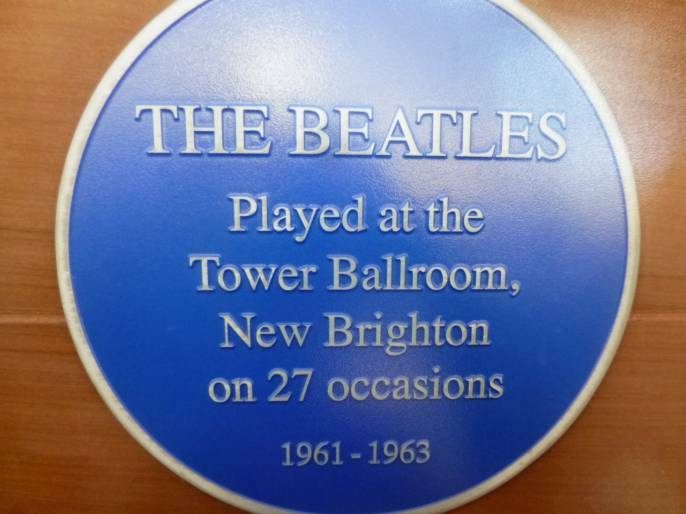 The Beatles “farewell ball” to mark one of their trips to Hamburg, was held here in New Brighton. Brian Epstein arrived on the scene and negotiated with Sam Leach to use The Tower to continue promoting The Beatles (a long story that didn’t end well for Sam… ). Their appearance fee for the Tower shows catapulted, from £10 a show at the start, to a massive £40 a year later (and seven years after that of course they were offered $1,000,000 to play one booking in New York l1). Frankly, New Brighton has its important place in Beatles folklore and we really should make a little more of it – it could be the place where Beatles Wirral history gets the proper recognition it deserves. The first official promotional photos of them were taken in Wallasey Village, their first stage suits were bought in Birkenhead, they were first worn at a public booking in Heswall, Ringo’s first appearance as a fully fledged Beatle was in Ellesmere Port….. New Brighton would be a great place to celebrate not just its own connections with those four lads who went on to shake the world, but with that rich wider Wirral Beatles history that hides itself away so well. Wouldn’t it be something if we could have some sort of permanent exhibition place that would capture the imaginations of Beatles fans who still come from all over the world to marvel at all things fab?!!. 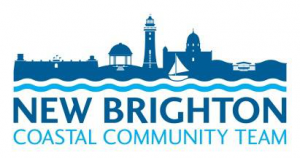 August 2016 saw the 3rd Anniversary of the formation of The New Brighteners (Aug 2013), although beach cleaning in new Brighton had been going on for some 4 or 5 years previously. It has been another busy year. Although this Summer’s somewhat indifferent weather did, at times, bring in less beach visitors, BUT when the weather was good, and we did see some cracking weather, the crowds and the rubbish were back with a vengeance. 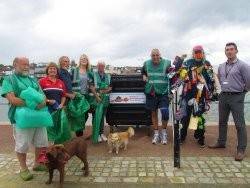 successfully bid for funding under the ‘Your Wirral Wide’ scheme to kick-start 4 new litter picking groups. The four new groups are up and running and being operated by: Heart of Egremont, Route 56’ers, Wallasey Central Park and West Kirby Transition Town. our regular weekend beach cleans continued augmented by the ad hoc cleans. 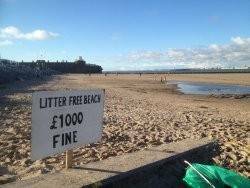 This means that especially during the high season, the beaches somewhere are being litter picked by someone daily. Some of us (the royalist branch? Ha Ha) got involved in the ‘Clean For The Queen’ in March to celebrate the 90th birthday of Her Royal Highness. 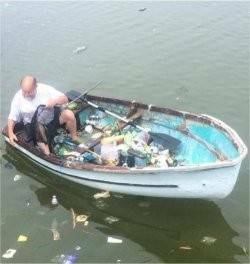 One of our members has taken to the Marine Lake in a renovated rowing boat to scoop out rubbish, and ended up in the local press—well done Peter! Good publicity as well! Occasionally we stray from the beach to dry land. A couple of members had noticed that there was a lot of rubbish around the Tower Grounds, so a litter pick was organised in March. We were out for a couple of hours. Litter was all over the place, and semi-buried under the bushes by the small roundabout we uncovered quite a haul of small polystyrene bits from the 2013 December 5th storm, as well as the usual plastic litter all over the area. One passer by, walking his dog, remarked upon seeing one of us picking up a piece of rubbish, ’I walk past that every day… been there for ages.’ Of course it never occurred to him to pick it up! Once finished it looked a treat. We cleared about 11 bags worth of litter. We joined with SAS (Surfers Against Sewage) for their Spring & Autumn cleans again in April and October. Now they have their Area rep, Patric Rogers in New Brighton, it means both groups can work together really easily. Big thanks to Patric for organising those cleans. Pirates. Many folk remark that this is quite unique. Whether or not this is true, it does indicate how much folks love New Brighton and just get stuck in together. A highlight this year was being shortlisted and then winning the Neighbourhood Improvement Project category in the Echo Environment Awards in April. We were also shortlisted for the Wirral Tourism Awards but were unsuccessful this time around. A chance to do a beach clean AND sample wine occurred in June. 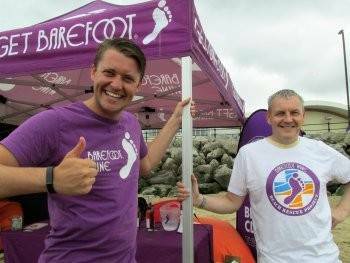 The Barefoot Wine Beach Rescue came to New Brighton in June. During the day it attracted about 70 folk who came to help clean the beach (and sample wine!). A huge amount of litter was cleared, and a generous amount of wine was ‘sampled’. Same again next year? now and again we get called upon to do odd things (no, not wine sampling again) but the emergency evacuation of a Settee! Someone obviously decided to ditch their three piece suite, and the settee washed up on the beach between New Brighton and Egremont in May. The arm chairs washed up later in odd places as well. Full of water soaked foam it was too heavy to move, so armed with a sledge hammer it was broken up and placed on the prom., and later collected by Biffa. Hard work but very satisfying! One of the continual problems on the beach, and elsewhere, is dog poo. So the Council produced an excellent video called, Do The Right Thing (You Tube – https://www.youtube.com/watch?v=c-CUzwcGsaM) We were asked to be part of it, and a few of us were free (our 30 seconds of fame!) so along with lots of other folks we ended up on the beach shouting ‘Do The Right Thing’. Great fun to do. It is also worth mentioning here that a large number of dog owners (some Brighteners, some Pirates and some neither) not only clean up their own dog’s poo, but others’ poo as well. Kudos to them! We got involved with another wonderful organisation called the Marine Conservation Society. They arrange beach cleans all around the coast in September, and this year we had an MCS Beach Clean Weekend. A really good time. with variations of the theme – …. 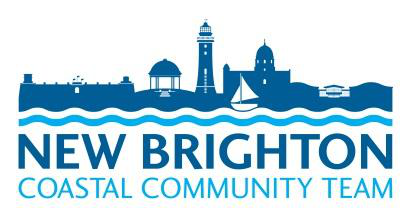 Keep New Brighton Ship Shape! Sometime the simple solutions are the best. It is also worth mentioning that through the year we have been able to work with, be helped by and received encouragement from some great folk in the Council. But special thanks to Caroline L. and Michelle G., you are both ace. Thanks also to all the others we have entangled in the messy litter business. We do appreciate you! Beach cleaning is now winding down for the winter, but there is still work to do. Significant amounts of litter is washed in with every tide, mixed in with seaweed. Often this has been in the sea for a long time, but at least removing it helps reduce, even in a small way, the trillions of tonnes of plastic and other waste in our oceans. We can’t get away from the fact that simply re-acting to the litter by clearing it up isn’t curing the problem, and the seemingly never- ending task is, to be honest, quite discouraging at times. So……..? We have decided that, in addition to re-active beach cleaning, it is time to be more pro-active, and so we are formulating a New Strategy. We are going to confront the problem which is largely, the anti-social actions of the: drop/discard/chuck/throw/can’t be bothered to bin it, brigade. They may be a minority but they cause the majority of the problem. We are going to use art, drama, video and music and some ‘shock’ tactics to hammer home the message—Bin It Don’t Beach It. We also want to continue going into schools as and when, and getting DoE (Duke of Edinburgh) groups involved with beach cleaning. We had a small trial run at the end of the summer of the sort of thing we are thinking of. But close to, in small writing additional words could be seen……. It made people look, it provoked a reaction and it made people think. for new and replacement equipment. WooHoo! As you can see, it’s been a busy year. So many did so much this year and if anything got missed out, apologies. We hope you all have a good Christmas and here’s to a Litter-Free New Year. ………. On The Beach ………. 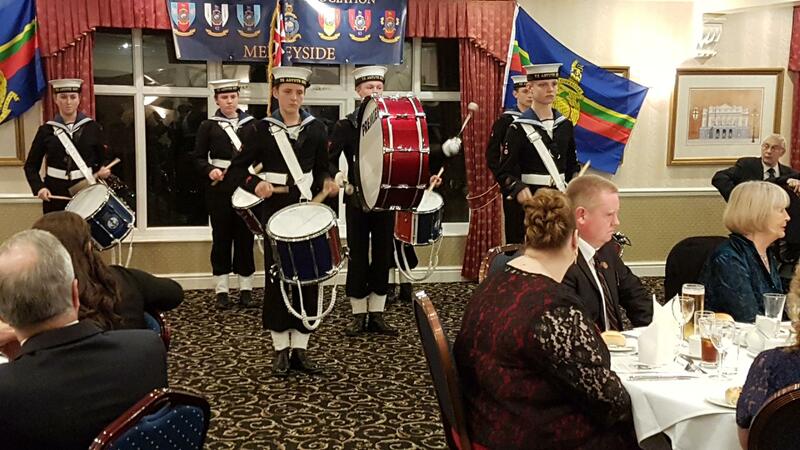 On the 29 October the Sea Cadet Corps of drums were invited to play at the Royal Marine dinner at the Hollins Hey Hotel New Brighton which the Mayor and Mayoress where the guests of honour. 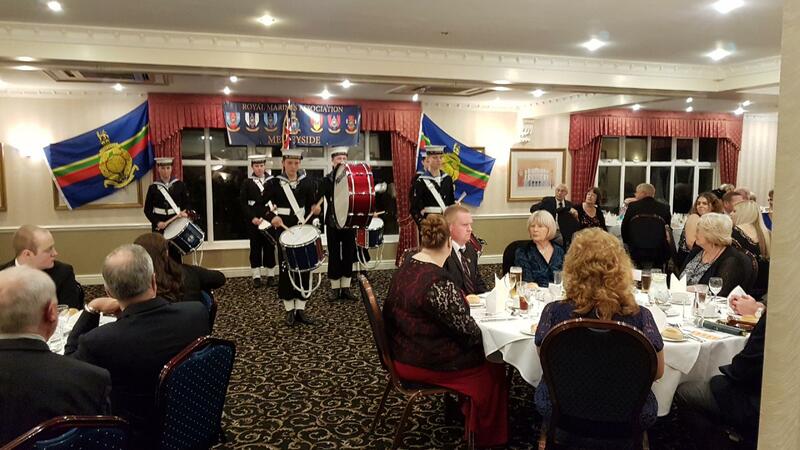 On the 4th November Residents from Darcy Court Port Sunlight were invited to the TS ASTUTE unit to present the Chairman Mr John Mason with a cheque for £535 which will go towards the units expenses the Corps of drums put on a display for the guests who were later shown around the unit and met the ships company. 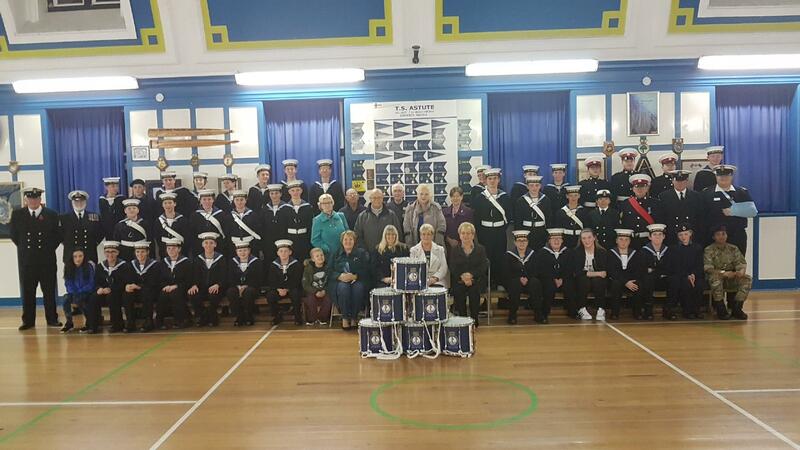 The TS ASTUTE cadets have also been very busy in Morrison’s the last couple of Saturdays finishing next Saturday 12 November selling Poppies for the Royal British Legion on the Sunday 13 November the whole ships company will be on parade for Remembrance Sunday marching from Royal British Legion Withins Lane to the Cenotaph on the prom to Honour our fallen Heros then back to the Legion. Year 5 and 6 visit to St Andrew’s church, New Brighton. 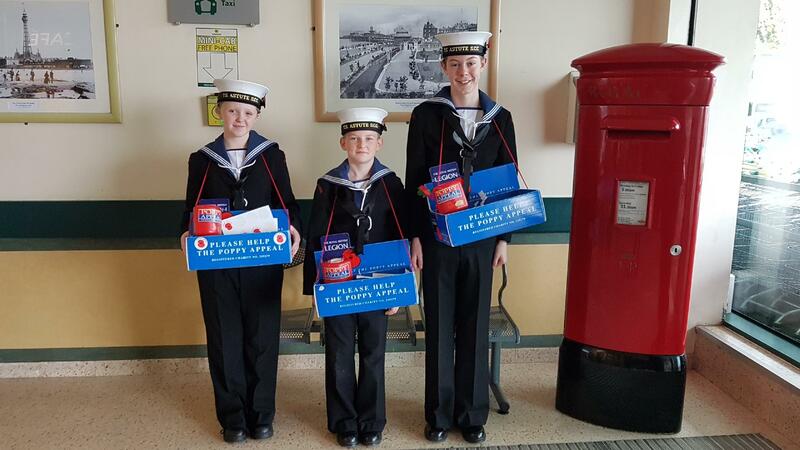 In November the children from year 5 and 6 at New Brighton primary school had the opportunity to visit St Andrew’s church and take part in a range of activities about the importance of Remembrance Day and how WWI and WWII affected our local area. The children worked in small groups and were taught by local church members, some of whom had experienced world war two when they were younger. This gave all of the children an invaluable insight into different aspects of both wars, the groups focussed on rationing, air-raids and evacuation. 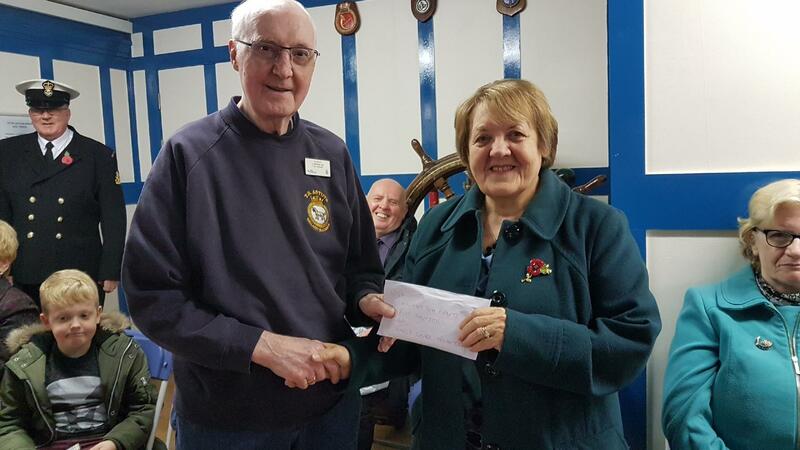 They also found out about Wilfred Owen, the role of the Mersey ferries in world war one and the symbolism and significance of the poppy during remembrance week. Pupils found the sessions engaging and they really enjoyed talking with the volunteers from the church. All of the children felt it was important for them to learn about the act of remembrance and the local history of WWI and WWII. The church members brought these areas to life for our pupils and it will have been one of their most valuable learning experiences. The children and staff of New Brighton Primary would like to thank all of the volunteers and Reverend Lorraine at St Andrew’s for welcoming them into the church, for sharing their knowledge and experiences and for enhancing their knowledge and understanding of remembrance at this important time of year. 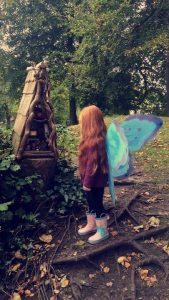 A local sculptor has been chosen to create New Brighton’s new Mermaid Trail. 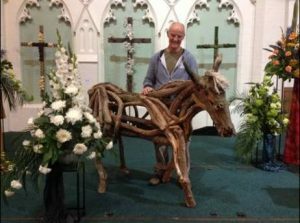 Barry Canning-Eaton, who lives in Wallasey, will design and create the six statues, five of which will be decorated by local artists, schools and community groups. 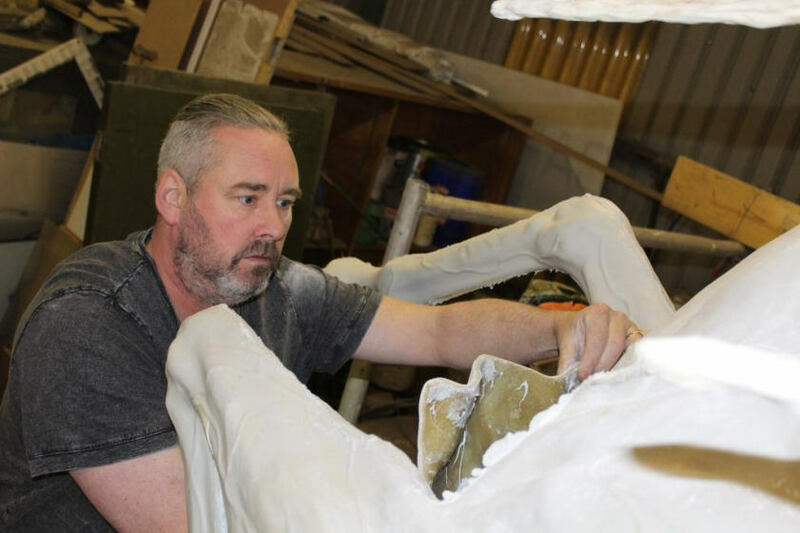 Barry (pictured) sculpted the ‘Spirit of Liverpool’ statue that currently stands in Central Station, Liverpool, following his commission by artist and designer of the statue Rick Myers. The Mermaid Trail, which takes its inspiration from the ‘Black Rock Mermaid’, who was said to have appeared to a local sailor in New Brighton in the 18 century, will feature a series of six mermaid statues right across the resort. 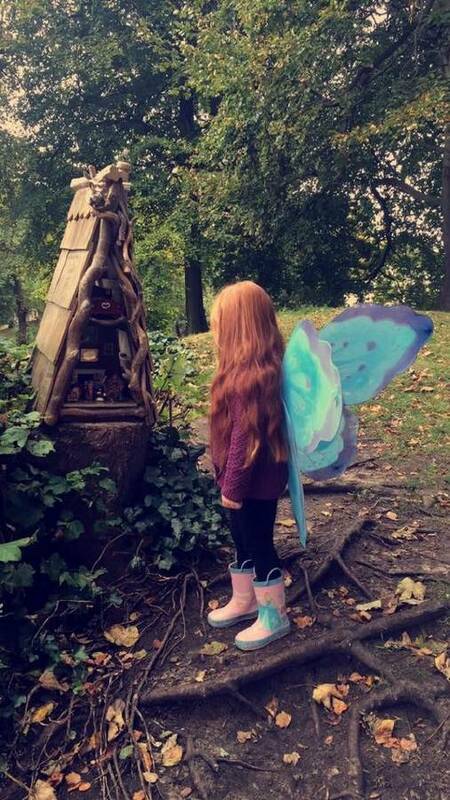 A competition will be launched soon for local groups to decorate the statues. The project is moving forward thanks to a successful bid for funding by New Brighton Coastal Community Team to the Burbo Bank Extension Community Fund, a grant scheme set up by DONG Energy to benefit voluntary groups and organisations located near to the coastline where it is carrying out the extension to the offshore wind farm. It is anticipated that the sculptures will be installed ready for visitors in the late spring of 2017.
www.wirral.gov.uk/newbrighton and its work can be followed on Twitter @wallaseyteam. 21st April World Book Night Ann Cleeves Murder Mystery See if you can guess whodunit? Church restoration is the nation’s best! 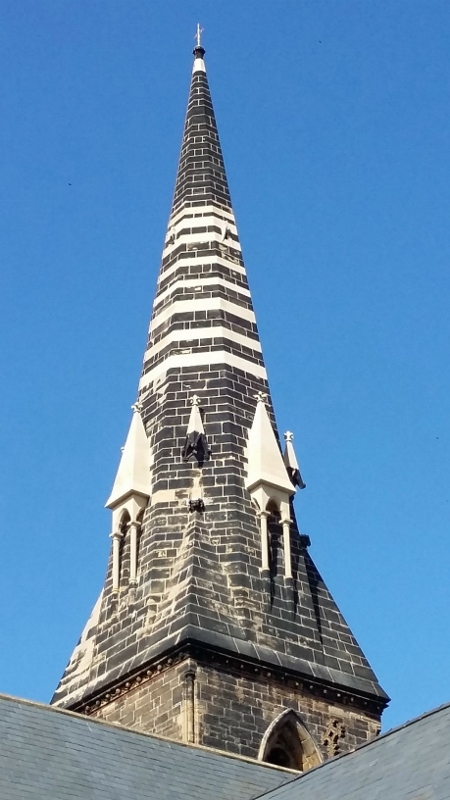 New Brighton has a new award-winning landmark – the restored spire of St James’ church. The spire, whose rebuilding and restoration was completed in March, has won the National Churches Trust award for the “most innovative, high quality church conservation project” of 2016. Yes, the best in the country this year! The spire of the Grade II listed St James’ church had to be taken down and rebuilt after it was found to be unsafe. Work started in August last year, and was completed when the Mayor of Wirral fixed the new cross at the top of the 172 foot spire at the end of March. The cost of the project was over £400,000, and it was only made possible through a grant of £250,000 from the Heritage Lottery Fund, the remainder being raised through many fundraising initiatives by parishioners. The rebuilding of the spire was a spectacular sight and a major talking point in the town. When it was completed, the stonemasons had restored much of the architectural detail which had been lost over the years. The renovated spire is now firmly established as a feature of the New Brighton skyline. New Brighton can be proud of its parish church’s restored spire and the national recognition it has received. Hello everybody just to update you on events at our Lifeboat Station, we have had a very busy time both recruiting and training crew and I feel sure you may have seen the boat afloat undertaking the drills and exercises as part of this well established programme. Our station reopened in mid August and we continue to provide the service expected from the RNLI to all visitors to our coastline along with other river users both local and from further afield. around and if you wish to use our shop to purchase some unique Christmas cards and other gifts then please do so. 10:30pm: Carols followed by Solemn High Mass. Ss Peter. Paul and St Philomena‘s Church, New Brighton has received support from the Heritage Lottery Fund (HLF) for a third project, this time to restore the two beautiful marble side chapels, it was announced today. 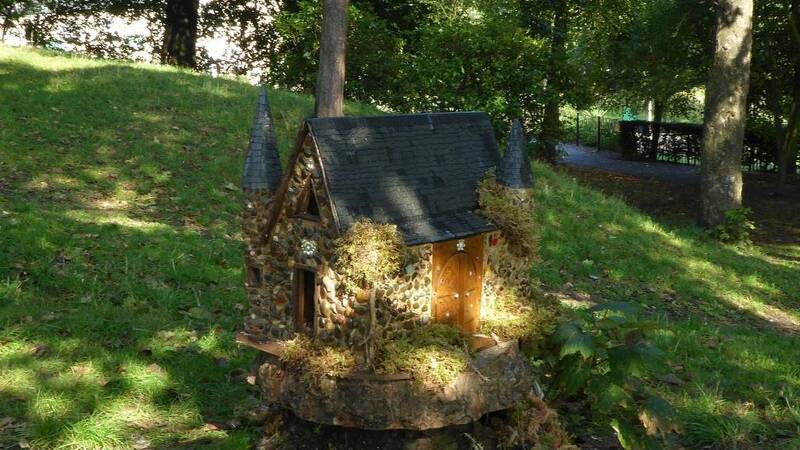 Total possible HLF Award could be £250k for this project. The aim is to halt water dripping through the barrel roots, brickwork and windows around the side chapels, restoring damaged structural concrete and plasterwork. Development funding £27,100 was awarded in September to help The Institute of Christ the King (ICKSP – the religious order who look after this church for the Diocese oi Shrewsbury). 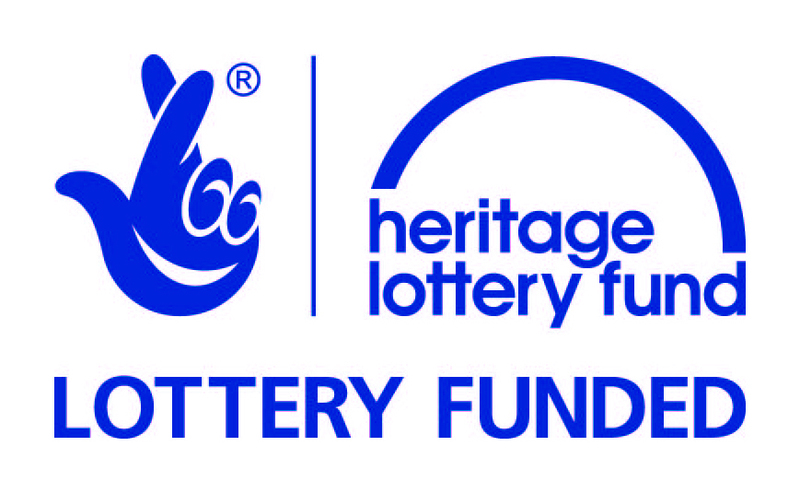 prepare plans to apply tor a full HLF grant of up to £222,900, in the New Year. In conjunction with the building work. the project will target younger audiences. A graphically designed Heritage Education Pack will be developed to encourage schools to use the building as a cross-curricular resource and enjoy the art. history, design. Lecture events and visits will be organised to engage local students of Architecture and Conservation at local universities. In order to fully utilize this wonderful sacred space for the whole community. choirs and local singers will collaborate to produce a semi-professional pertormance of Handel‘s Messiah. publicised through social media. The addition of a kitchenette will help volunteers organise hospitality for visitors as more volunteers are recruited to help with Guided Tours. We’ve had a wonderful summer in the café serving many, many people with hot and cold drinks, ice-creams, snacks, meals and delicious cakes. Our evening opening for Halloween and Bonfire Night proved popular too and we’ve thoroughly enjoyed hosting many private parties throughout the year. As the days draw in we have reduced our hours to 10:30 – 4:00 but our welcome is just as cheery. The staff are ready to book in your Christmas and New Year parties. Each one individually arranged to suit your style. Call 0151 638 2666. Our Afternoon Teas remain ever so popular at £8.50 each, or two for £15.00. If you book in advance you can pre-order your favourite sandwich fillings and cake varieties and pay a little more to have the table and chairs dressed for a more special occasion. Christmas lunches and special seasonal meals will be available throughout December. Vale Kids is our pre-school playgroup in their own well equipped room in Vale House. On fine mornings the children can be seen playing safely in the enclosed Bandstand area of the park. Currently there are just one or two spaces available for children age 2-4. 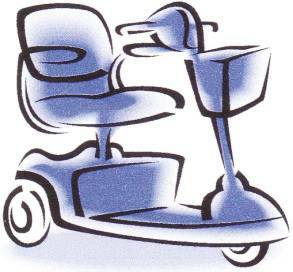 Meeting weekdays, term time only 9:15-12:15, we charge £8.50 a session. Please call Louise on 0151 639 1386 to reserve a place. Local girl Michelle Billington Creator & Founder of Foot in the Door Films CIC is turning to her own community of Business Creators & Leaders to help her make change. Are you looking to add value to your business? Are you a Business Creator who likes to help the community? 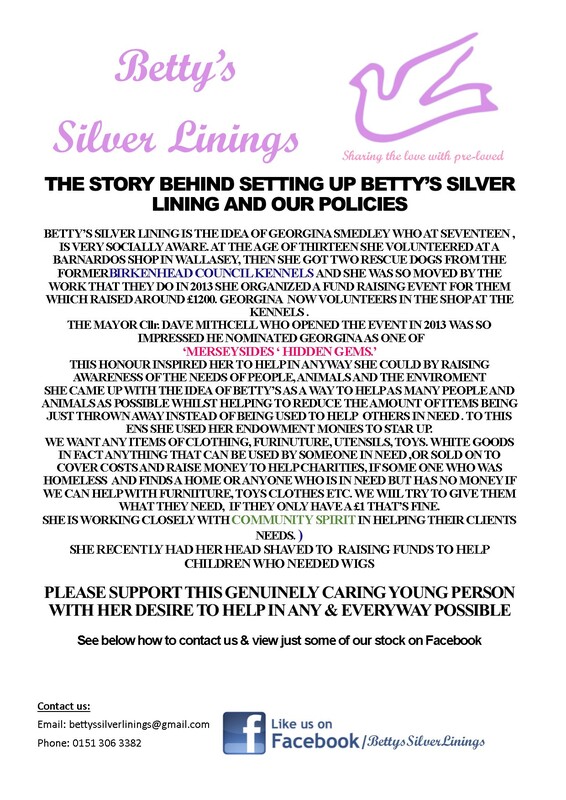 Are you an individual who would like to help make change? 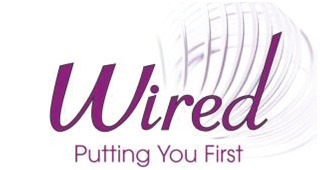 Are you successful and would like to do something different? Would you like a Co-producers credit on are movies? Would you like to attend our film premiers? plus lots more! I am looking for a group of business creators who want to make History that will leave a Legacy that will go on beyond our life time. All successful creators get to a stage in there lives when that one person made it all happen, I need you to be that person now.